In December 2015, Android Studio as the official IDE in developing app Android have release new version Android Studio v.1.5.1. Whereas one month earlier in November 2015 has already released Android Studio v1.5.0. Of course, the release of the latest version to fix some bugs in previous versions. Because the latest version alwasy offer a bug fix and update new features, it make us to try it by installing new version. For android developer who had already installed the previous version Android Studio, no need uninstall and then install the latest version from beginning. We just do an updating from the current version of Android Studio in our PC. 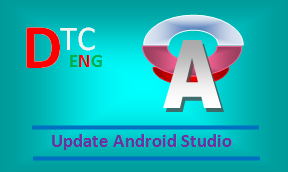 After the process of applying the patch file is completed, the process of updating from previous version to the latest version of android studio has been completed and Android Studio will restart.